This coming Sunday, (10/29) the 3-4 Oakland Raiders will pay a mid-season visit to the 4-2 Buffalo Bills at 1pm ET at New Era Field in Orchard Park, New York. Prior to this season, the Raiders appeared to be a daunting opponent for the Bills as they were coming off a promising 12-4 season and were given an over/under of 10 wins for 2017. Buffalo, on the other hand, continued its vicious cycle of mediocrity by finishing 2016 with yet another 7-9 record and missed the playoffs for a record 17th consecutive year. 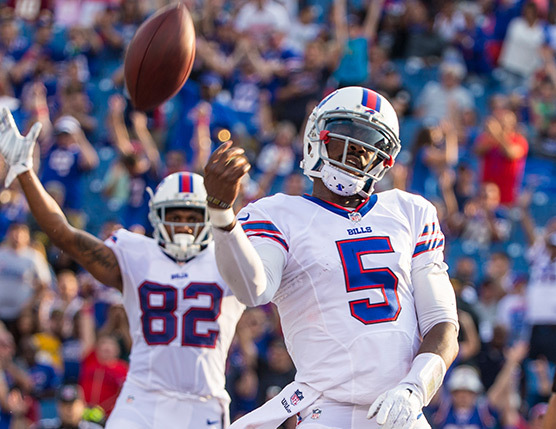 With a complete overhaul of coaching and a relatively small number of players returning, Buffalo’s over/under for wins was listed at merely 6. Further dissipating hopes of success was the surprising trade of former 1st round pick, Sammy Watkins, to the LA Rams during the preseason which gave rise to talks that the Bills were committing to a “tank” in an attempt to improve their 2018 draft stock. Given the turbulent offseason, many Bills fans would have guessed that even the 6 games the team was projected to win seemed high, yet here we are in week 8 with Buffalo favored, yes you heard correct, FAVORED, by 3 points over Oakland according to Vegas Insider. The unforeseen odds come as a result of both the Bills’ early success and the Raiders’ sluggish start. Oakland lost 4 straight after starting 2-0, but are coming off an impressive 31-30 win against a strong Kansas City team in the closing seconds last Thursday. Buffalo also enters the contest following a thrilling 30-27 comeback victory over the Tampa Bay Buccaneers, a game in which star running back, LeSean McCoy, returned to stellar form with 2 touchdowns and 122 all-purpose yards. This Sunday the Bills will look to improve the chances of ending their playoff drought while the Raiders will try and carry the momentum from Thursday’s win to get their season back on track. Buffalo’s Secondary will be Tested: Although Oakland only ranks 18th with 218 passing yards per game, quarterback Derek Carr comes to Buffalo following a monster game in which he threw for 417 yards, 3 touchdowns, and no interceptions against the Chiefs. WR Amari Cooper reeled in 11 receptions for 210 yards and 2 touchdowns alongside Jared Cook who added another 107 yards and ranks 8th amongst TE’s for total yards on the season. With RB Marshawn Lynch suspended for putting his hands on a referee during a scuffle in last week’s game, look for Carr to throw early and often. Buffalo’s secondary could be in trouble as both CB E.J. Gaines (hamstring) and S Jordan Poyer (knee) were injured against Tampa Bay. Head Coach Sean McDermott told the media that Poyer and Gaines remained day-to-day, though the outlook doesn’t look promising as neither player practiced Wednesday. Even with Poyer and Gaines playing, Buffalo gave up 328 and 384 passing yards in their last two weeks, so you can be sure Oakland will look to expose a depleted secondary that ranks 26th in the league in passing yards per game. Oakland will Need to Shutdown Shady McCoy: Buffalo’s offensive success relies heavily on the performance of RB LeSean McCoy. The Bills are 3-0 this season in games where Shady has had over 100 all-purpose yards while they are 1-2 when he has had less. The Buffalo passing attack has been one of the league’s worst, so the Raiders will need to ensure they don’t allow QB Tyrod Taylor to get going which will permit them to stack the box and contain McCoy. Although the Bills’ receiving core remains weak, Oakland could be disadvantaged if CBs David Amerson (foot) and Gareon Conley (shin) are not healthy enough to play Sunday. Should both players be sidelined, look for Tyrod Taylor to throw a little more which will create additional room for Shady to work against a subpar Oakland rush defense that ranks 19th with 114 yards given up per game. Tyrod Must Throw Downfield: Tyrod Taylor has been a risk averse passer as he rarely throws the ball downfield. Coming into last week’s game, he had attempted only 21 passes over 15 yards through 5 games. However, Taylor attempted 11 such passes and completed 5 of them against the Bucs which forced their secondary to respect the deep ball and enabled LeSean McCoy, with the help of a healthy OT Cordy Glenn, to gouge the defensive front for some big gains. With TE Charles Clay still injured, the Bills will need to spread the ball downfield to Jordan Matthews, Logan Thomas, and the newly acquired Deonte Thompson. It is evident that Tyrod is not the most talented passer, however, Buffalo still needs to take deep shots to keep Oakland’s defense honest as a way to free up Shady and allow Tyrod to use his feet. Prediction: Buffalo Prevails 24-17: With the over/under at 45 points, this likely won’t be a shootout as Buffalo remains a top defense even with their recent hiccups against the pass. The Bills’ robust run defense, which ranks 4th with 3.4 yards allowed per attempt, will eliminate the Oakland rushing attack that is already impaired without Marshawn Lynch. WRs Michael Crabtree and Amari Cooper will allow the Raiders to gain significant yardage through the air given a potentially banged up Bills secondary, however, S Micah Hyde and rookie CB Tre’Davious White will hold down the fort and force Derek Carr to throw a few interceptions. Buffalo leads the league with a +10 turnover margin and they will continue this trend which should give Tyrod some short fields and enable the Bills to put up enough points. Lastly, the infamous Bills Mafia will electrify New Era Field and provide an extra boost for the Bills which will improve their home record to 4-0 on the season and bring a playoff birth closer to reality.